In the 20 years between 1919 and 1939, Ettore Bugatti later assisted by his very able son Jean Bugatti, designed, built and sold almost 8,000 cars. 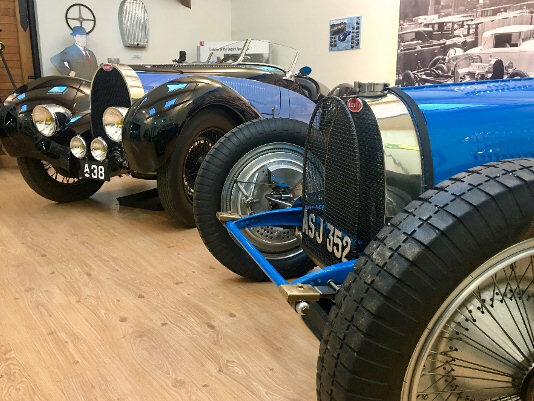 However during the last 20 years of the Bugatti company (1943-1963), Ettore Bugatti and then later Roland Bugatti assembled and sold 7 cars, these using pre-war parts and to a 20 year old design. How and why could this have come about? James Randle has had a long and distinguished career in the motor industry which included 27 years at Jaguar. One of his most famous projects was the Jaguar XJ220 and he was closely involved with the development of the Series III E-type as well as responsible for significant new designs and patents. Please email us on info@bugatti-trust.co.uk to register your interest for what will be a fascinating insight into our guest speakers’ knowledge and careers. Each fundraising event is £25 per person and will include a seated meal as well as a Q&A opportunity. Our first educational event of 2018 will be an outdoor display focusing on electric bikes and cars built by students as part of their engineering degree to take place over the weekend of the very successful Prescott Bike Festival held April 14th/ 15th. The Bugatti Trust is an official partner of the government’s 2018 Year of Engineering campaign and university teams already confirmed for ‘Bikefest e.v.’ include Bath, Bristol, Kingston, Nottingham and Salford.